"In a story that's alternately hilarious and awww-inspiring, adorably finicky Louie unhappily dodges the multitude of messes he finds in his story's food splattered, scribble filled pages -- until he discovers an unexpected silver lining hiding under all that sloppy unpredictability. Never have peanut butter and jelly wrought such delightful havoc on a picture book's pristine pages! " Little Louie's story keeps getting messed up, and he's not happy about it! What's the point of telling his tale if he can't tell it perfectly? But when he stops and takes a deep breath, he realizes that everything is actually just fine, and his story is a good one--imperfections and all. 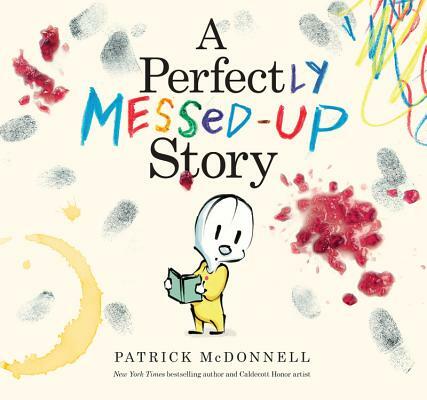 Patrick McDonnell is the creator of The Monsters' Monster, a New York Times bestseller; Me...Jane, a Caldecott Honor Book and a New York Times bestselling picture book biography of Dr. Jane Goodall; and the award-winning picture book Art. He is also the creator of the beloved, internationally syndicated comic strip Mutts, which features the characters that star in five of his previous picture books including Wag!, The Gift of Nothing, Just Like Heaven, Hug Time, and South. Patrick sits on the board of directors of the Humane Society of the United States and has won numerous awards for both Mutts and his animal welfare work. He lives in New Jersey with his wife, Karen; their formerly feral cat, Not Ootie; and their adopted terrier, Amelie.